The huge massifs of Cho Oyo (8153) and Gyachung Kang (7922) dominated the head of this rugged canyon. Countless others summits loom to either side. This trek is perfect for the committed trekker who wants to see every aspect of the Khumbu region. In addition to an ascent of the 5400 m Gokyo Rie pea, we take in to the Cho La pass which links Gokyo to the main Everest trek at Loboche. We trek the summit of Kalapatthar (5545) for close up views of Everest`s South-West Face. We also visit Everest Base Camp for a closer view. Finally we return down to Lukla via the famous Buddhist monastery at Tengboche. Please note that the narrow Gokyo valley rises quickly in altitude and therefore some of our trekking days are very short. This is vital if everyone is to be properly acclimatized before tackling Gokyo Ri and the Cho La. Day 1. Arrival Kathmandu – transfer hotel. Day 3. Flight to Lukla. Trek to Phakding 2623m. Day 4. Phakding – Namche Bazaar 3440m. Day 5. Namche Bazaar. Rest day – to Everest View Hotell and back to NB? Day 6. Namche Bazaar – Phortse Drengka 3680m. Day 7. Phortse Drengka – Dole 4200m. Day 8. Dole – Machhermo 4450m. Day 9. Machhermo – Gokyo 4750m. Day 10. Gokyo – Gokyo Ri 5357m – Gokyo. Day 11. Gokyo – Dragnak 4700m. Dag 12. Dragnak – Cho La Pass 5368m – Dzonglha 4700m. Day 13. Dzonglha – Loboche 4930m. Day 14. Lobuche – Everest BC 5364m – Gorak Shep 5170m. Day 15. Gorak Shep –Kalapatthar 5545m – Pheriche 4280m. Day 16. Pheriche – Tengboche 3867m. Day 17. Tengboche – Namche Bazaar 3440m. Day 18. Namche Bazaar – Lukla 2804m. Day 19. 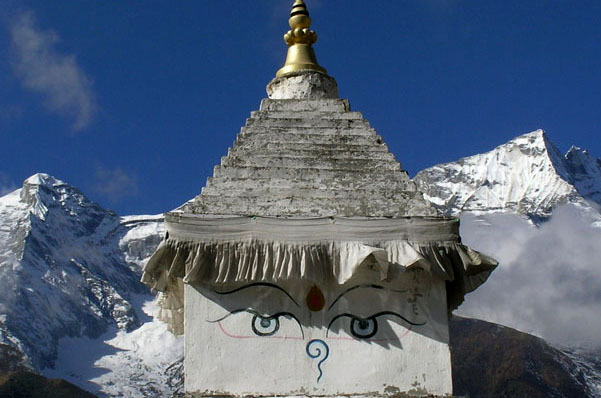 Lukla – Kathmandu. Transfer to Hotel. Day 20. Kathmandu. Free day in hotel, shopping in Thamel, sightseeing in Kathmandu. If You want to climb Imja Tse/Island Peak 6189m – You need to add 4 more days. 1 – 4 pax : 1680 USD. 5 – 8 pax : 1575 USD. 9 or more : 1470 USD.